The Obelisk of Light has long been the Brotherhood's foremost symbol of "Peace Through Power." Standing at an imposing twenty meters tall and tipped with a red focusing crystal, the black monolith exists to protect Nod installations from ground assault. The Obelisk has been continuously upgraded over its long and distinguished history, culminating in the TW3-era "Isis" iteration, powerful enough to cut through Mammoth Tanks while also demonstrating the flexibility required to sweep across waves of infantry. 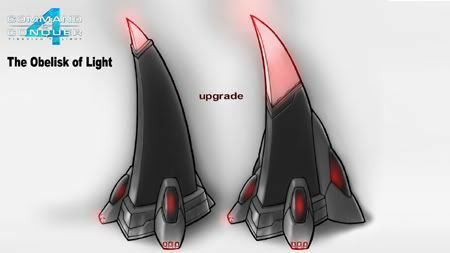 Combined with its ability to link with Nod Beam Cannons for extended range and firepower, the "Isis" Obelisk was the most deadly defensive structure of the Third Tiberium War. To see the full Unit Profile click here.